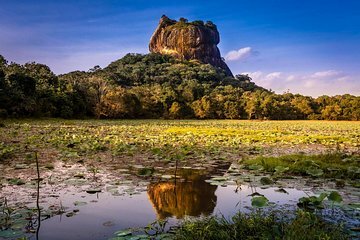 Gain a better understating for Sri Lanka, the island nation in the Indian Ocean, on this full-day day trip to Sigiriya and Hiriwadunna from Colombo. From riding a bullock cart to exploring a village town, get a feel for what everyday life is like for the people who live there. See the ancient Buddhist ruins, the Sigiriya rock fortress, in Dambulla, and take a boat cruise on a nearby lake. This full-day tour of Sigiriya and Hiriwadunna starts with an early morning pickup from your Colombo hotel. Be ready for early morning pickup, and then hop into your air-conditioned vehicle for the day. For this private experience, you can choose a group size from one to eight people. You’ll want to either eat breakfast before your pickup time or bring something with you. Your first stop is in Dambulla at the Sigiriya rock fortress. You can climb to the top of the fortress or further explore the ruins of this ancient civilization. After your time here, continue on to the village of Hiriwadunna. Walk along the reservoir before taking a bullock ride around to see views of the village. Then, your guide takes you on a short boat cruise on a nearby lake. Rest up, and enjoy a buffet-style lunch made by the women of the village (own expense). Follow your guide, and journey by rickshaw back the original starting point of your tour where you’ll get escorted back to your hotel in Colombo. Arrive in Colombo in late evening. We enjoyed the trip, but the harrowing drive with a new tour guide was a minus. He knew the route but had never been on this trip. He had limited English. When booking the trip, and for the price of a private tour, we had anticipated that he would be the guide through out the day but we were handed to other guides along the way. With that you have to factor in the expected gratuities of 500-1000 Rupies for each guide 5. Overall, the trip was good hence four stars. Hiriwaduna was better than Sigiriya, which is on par with experiencing Chitzen Itza in Yucatan- fascinating and valuable experience but cheapened by the tourist trap feel due to all the poor hawkers of inexpensive souvenirs and guides for hire. Hiriwaduna is a good experience, but it is not an authentic village but an accurate recreation of a traditional village. It was still worth the trip.